1. The material of this belt is brazil leather. The width is 39mm and the thickness is 3.2mm. The surface is dyed as double-color. The edge of the belt is cutted. The buckle is fixed by 4mm width leather strap. 3. The belt can be meet the requirements of environmental protection of Europe and America. If necessary, we could send you our production test report. 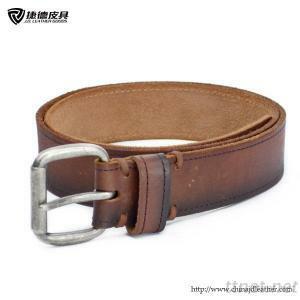 We are leather belt suppliers and manufacturers. Any requires or more details, pls feel free to contact us at any time, thanks.